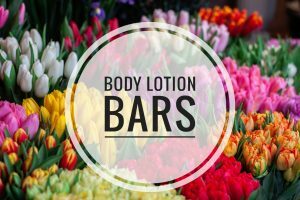 Body lotion bars are a great and convenient way to apply your lotion each and every day. There aren’t bottles or jars to worry about opening but just a bar of your lotion to slather on your body. I found this recipe last year when I was trying to figure out what to make for a Mother’s Day gift and it has been a huge hit. 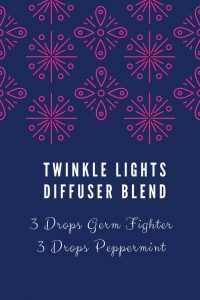 I always like to find ways to share my love for essential oils with my family so a great DIY recipe is a great way to do that. 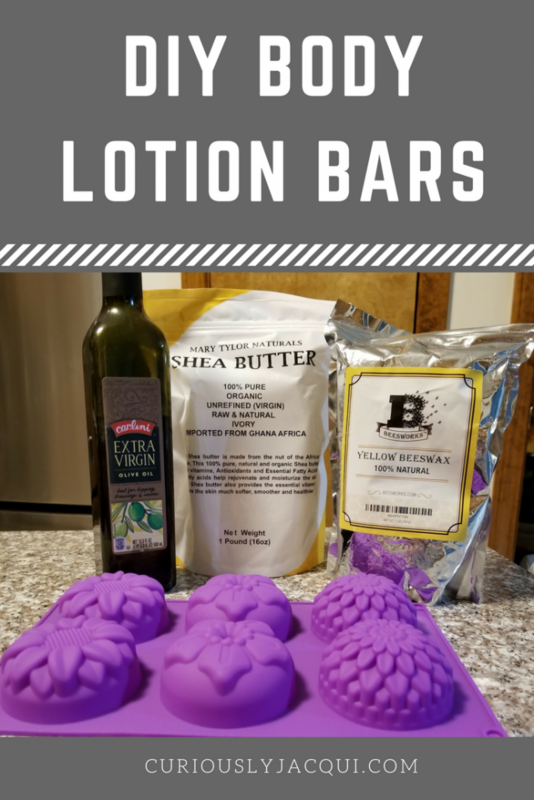 I haven’t experimented much with different essential oils in this recipe since my mom (who watches my nephew)always gets some of the lotion bars I make . I like to make it kid-safe so I use lavender essential oil. 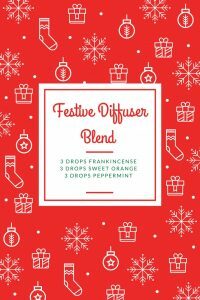 If you wanted to you could totally use whatever essential oil single or blend is your favorite. I also like to know exactly what is in my lotion. I have become so much more conscious of the ingredients in everything I put on my body and I am always on the EWG website checking out all my products. This recipe is so simple and all of the ingredients are great for your skin. 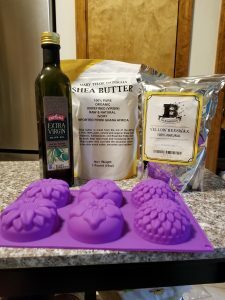 Over the last few months I have updated and rearranged this recipe to try to find the best ratio of ingredients and I think I have found a great mix. In a microwave safe dish (I like to use a glass Pyrex measuring cup) put your oil and beeswax and microwave until the beeswax melts completely. This will probably take a few minutes as beeswax has a high melting point. Now, stir in your shea or cocoa butter. You should be able to stir this to melt. If you need to you can put it back in the microwave to help melt the shea butter but typically I don’t need to. Next, add in your essential oil and mix well. Finally, pour the mixture into the mold and place in the fridge overnight to set. Enjoy every time you hop out of the shower for silky smooth skin. 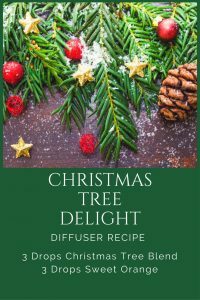 Christmas is the most wonderful time of the year and I am loving decorating and making my DIY gift for everyone on my Christmas list. 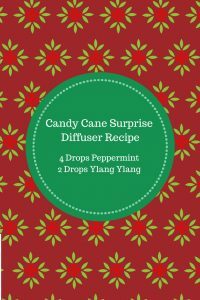 I especially love it when I can make something that will make my house smell wonderful. 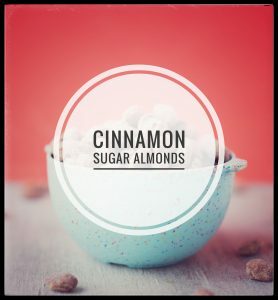 This recipe for Cinnamon Sugar Almonds will make not only your house smell amazing but will please everyone on your Christmas list. I am pretty sure I will end up having to make multiple batches of these delicious almonds as it is doubtful my husband and I wont be able to stop ourselves from eating some of these. For this recipe you don’t have to use almonds, so if you love pecans, cashews or peanuts feel free to substitute. Cook on high for 2 hours, stirring every 20 – 30 mins. After the nuts are done cooking, let them cool fully on a length of foil or parchment paper. When fully cool, store in air-tight container. I wanted to find a fun way to package these up so I can share them with my co-workers and my entire family. I found these cute Ziploc bags with poinsettias on them from the dollar store. I also want to find a cute recipe card that I can attach to the bags so I can share the recipe. I will be punching a hole in the bag above the Ziploc and attaching the recipe card to each one. This month I will me taking part in my own photo challenge. I have been wanting to take part in another bloggers photo challenge but I didn’t find one that I connected with so I scoured Pinterest for different ideas. 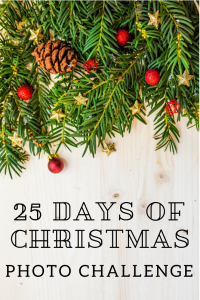 I decided on creating my own 25 days of Christmas Photo Challenge. I wanted to complete a photo challenge since I recently got a new Samsung 8+ and want to learn to use the camera to its full potential. Taking photos with a phone or a camera is something that I am not super familiar with but since my blog is brand new I know that quality photos will help my blog to stand out, especially on Pinterest. I also want to start sharing more on Instagram so I can hopefully grow my following there. I encourage you to take the time this month to challenge yourself to do something different. December ends up being such a busy month and goes by so fast. So, taking the time to pay attention to things around you and focusing on something small can help make you more aware of what is going on around you. December 1: Your view today. I will posting my photos on the Instagram account for my blog @curiouslyjacqui, so make sure you follow me there.